The new Lady Dancing Die 98394 is truly a die for all seasons. The dotted print from the Yuletide 6x6 set becomes a festive holiday dress here, with a overlay of glitter on her matching shoes. I've used the die with doilies, crepe paper and recycled sparkling water cans too - it transforms everything into an elegant dress for the graceful dancer. Create a fall or winter holiday card using at least one Memory Box die or stamp and post it on our Flickr page by 11:59 PM EST August 31, 2012. Two winners will be chosen and their card will be featured on the Outside the Box blog. One bonus winner will be selected for featuring at least one die or stamp from the new 2012 What's in the Box release. The Ornament Border Die 98417 cuts a set of tiny ornaments and snowflakes - perfect accents for cards, tags and mini-books. There are just so many ways to use the dies in the new Holiday Collection that it's sometimes easy to overlook the great stamps that are part of the collection too. 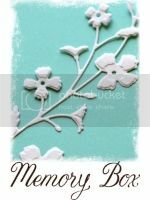 The background stamp - 12 Days G1899 - can be used as a neutral background as it's used here - or as an accent. Try diecutting it into a holiday banner or as ornaments, stockings or leaves to embellish a gift. View the entire collection here.